Welcome aboard the RANGER 85. We are one of the most versatile Sportfishing Vessels on the West Coast. At 85 feet in length you have plenty of fishing room and comfort. With a wide deck and a low profile the Ranger 85 is an excellent platform to fish on. 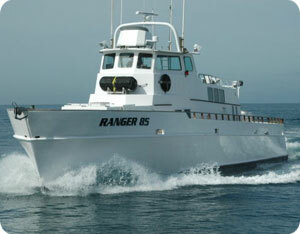 The Ranger 85 is the Largest Sportfishing Vessel in Ventura County. All new electronics including Wesmar Side Scanning Sonar, Furuno Fish Finders, and Satellite Navigation fill the bridge giving you an advantage on the fishing grounds. We pride ourselves in taking care of your fish. We have two fish holds that allow us to keep your catch very cold for filleting or we can freeze your fish for transporting home.